Google built Google Docs to help you create your best work — from work, school or home, and everywhere in between. We know crafting presentations, projects and reports takes time and energy. That’s why today we’re introducing Explore in Docs, Sheets and Slides to bring you insights, design tools and research recommendations so you can create better work, faster. Explore uses Google smarts to help you create amazing presentations, spreadsheets and documents in a fraction of the time they used to take… so you can get on with what’s most important in your life. It’s like having a researcher, analyst and designer by your side. We’ve also added new formatting suggestions to help make your data pop. Explore in Sheets is available on the web, Android and now on iOS, too! Crafting the perfect pitch deck or sharing your team’s story is hard enough without having to make it look great, too. Explore in Slides makes design polishing simple. As you work, Explore dynamically generates design suggestions, based on the content of your slide. Simply pick a recommendation and apply it with a single click — no cropping, resizing or reformatting required. We’ve seen that people save over 30% of the time they would have spent on formatting when they use Explore. So even if design isn’t your style, rest assured you’ll have a beautiful presentation to be proud of. Instantly. Explore in Docs makes researching and writing reports on the go a whole lot easier. Whether you’re writing about mobile retail trends or planning your next team offsite, you’ll get instant suggestions based on the content in your document. We’ll automatically recommend related topics to learn about, images to insert and more content to check out in Docs on your Android, iPhone or the web. We know that it’s helpful to refer to other content when writing an analysis, summary or proposal. That’s why we’ve also made it easy to find a related document from Drive or search Google, right in Explore. Less time spent switching between apps more time to polish your ideas. 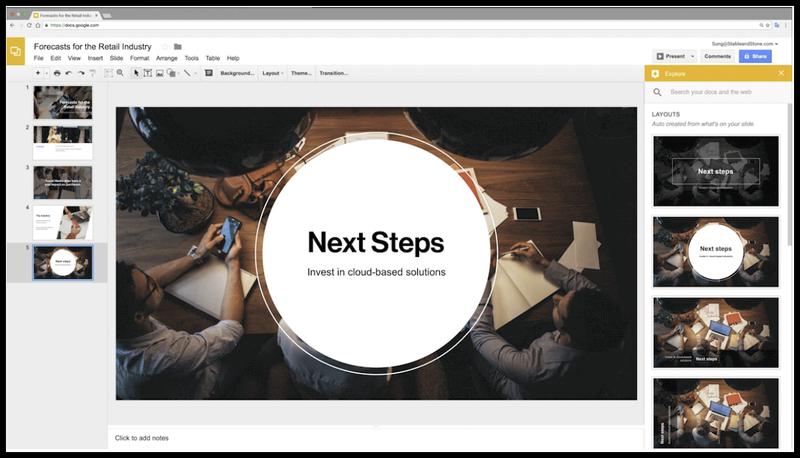 We designed Explore in Docs, Sheets and Slides to make creating and working easy and most of all, fast — all backed by the power of Google. Let Explore save you time so you can focus on what matters most.